Now I don't know about you, but I've always been a bit skeptical of sleep mists. Can essences of lavender, ylang ylang and other "relaxing" ingredients really make anyone fall asleep faster? 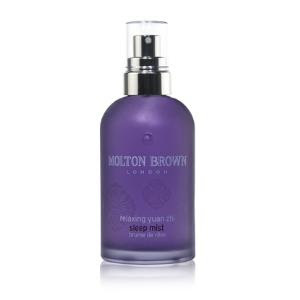 Well, color me impressed -- and consider my mind changed for good -- ever since I started using Molton Brown Relaxing Yuan Zhi Sleep Mist. This bottle, which does have the aforementioned lavender and ylang ylang in addition to bergamot, really does seem to help me fall asleep faster. We're talking within minutes -- and I have the chronic condition of laying awake for hours before bed, even when I'm exhausted! The mist, which has an intoxicatingly fresh scent that I just can't seem to get enough of, comes housed in a gorgeous violet-hued glass bottle, claims to "promote inner peace and encourage restful, healing sleep." I can honestly say I find this to be the case. I've been using this mist for the last week, spraying it liberally over my sheets and pillows, and I have fallen asleep within minutes. What's more, I stay asleep -- no waking up in the middle of the night for any reason! And best of all, I really do feel rested and completely at ease when I wake up in the morning. Now, this mist doesn't come cheap, as it retails for $44 on Molton Brown's website. But for anyone who's had problems falling asleep in the past, you should definitely give it a try. What's the worst that can happen? You get a good night's sleep?